"As a composer one forgets, in time, the fine detail of composition processes which produced past work... it must be left to scholars to recreate, slowly and painstakingly, earlier creative processes." Peter Maxwell Davies. 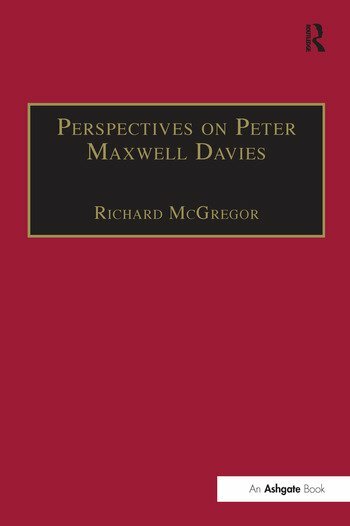 In the eight essays presented here, leading scholars of the music of Peter Maxwell Davies explore some of the composer's creative processes. David Roberts, Peter Owens and Richard McGregor examine Davies's employment of pitch-class sets and other models evident in his sketch material, while Joel Lester looks at the serial elements that produce structure and effect in the work Ave Maris Stella. The political, literary and musical influences evident in the 1987 opera Resurrection and in subsequent orchestral works come under scrutiny from John Warnaby. Davies's use of older dramatic forms and ritual is the focus of Michael Burden's examination of his music theatre. The composer's own descriptions of his compositional process contain distinctly modernist overtones as Arnold Whittall suggests in the concluding essay in the volume. The sustained textural multiplicity evident in much of Davies's music points to this modernism. It is a multiplicity mirrored in the variety of approaches taken by the commentators in this volume. The differing points of view on offer complement and contrast each other, allowing the reader to appreciate the different levels on which Davies's music works. Contents: Introduction; Alma redemptoris mater, David Roberts; Worldes Blis and its satellites, Peter Owens; A fox-trot to the crucifixion, Michael Burden; Structure and effect in Ave Maris Stella, Joel Lester; Peter Maxwell Davies’s recent music, and its debt to his earlier scores, John Warnaby; Compositional processes in some works of the 1980s, Richard McGregor; Max the symphonist, Richard McGregor; ’A dance of the deadly sins’: The Beltane Fire and the rites of modernism, Arnold Whittall; Appendices; Bibliography; Index.